This is a completely customized San Francisco S.F. 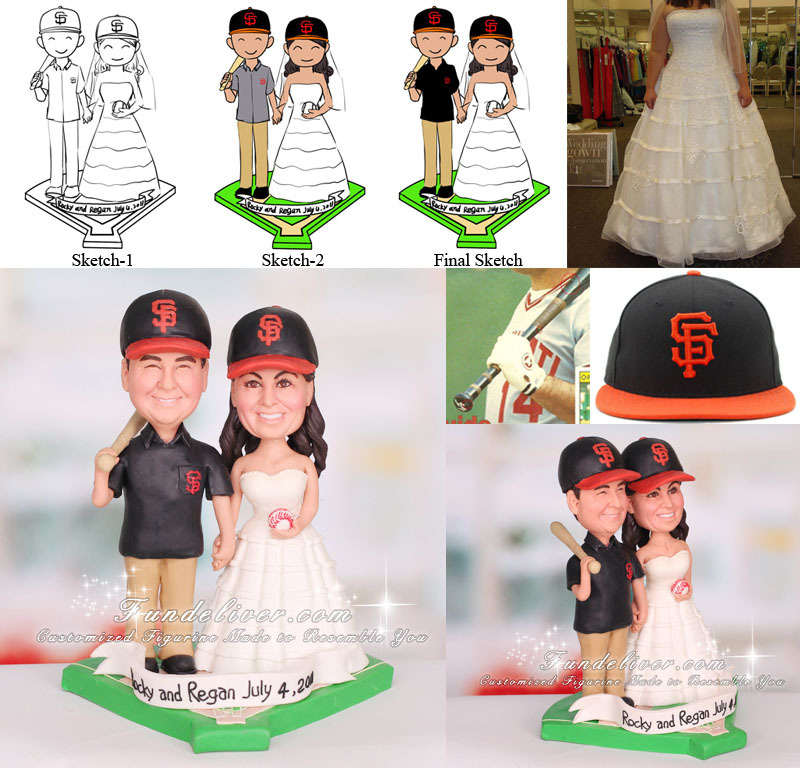 Giants wedding cake topper by one of our customers. They would like bride to be smiling, light makeup, hair curled down back with San Francisco Giants hat on, wearing wedding dress, arm bent holding baseball in left hand in front of stomach, right hand to be holding groom's left hand. For the groom, they would like him to be smiling, wearing San Francisco Giants hat, wearing black S.F. shirt, khaki pants, black shoes and holding baseball bat in right hand, bat resting on right shoulder, left hand holding bride’s right hand. The brims of hats in their reference image are flat, but they would like to change them to be curved. For the base, they would like a baseball field with "Rocky and Regan July 4, 2011". Fans of San Francisco Giants baseball team? This S.F. 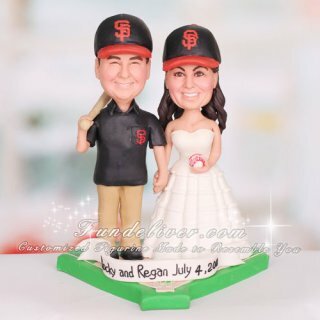 Giants baseball cake topper will be great choice for San Francisco S.F. Giants baseball fans! Also it is perfect for a groom's cake, bachelorette/bachelor party, and bridal shower or just as a wedding gift.